I just picked up Mars Colony today, which is a small, 2 player game. Earth sends Kelly Perkins, the best and brightest mind to try to set right the problems of the ailing Mars Colony before it completely destabilizes and fails altogether – one player plays Perkins, the other player plays The Governor and every other NPC. You put together 2-4 fictional political parties, loosely based on historical, real world political parties you think would make for good story fodder. You name real world political problems and those become randomized scenario generation tools for play. And then, you get to work trying to fix the problems. The mechanics are simple, and terrifying. Perkins develops plans to fix problems, rolls some dice in a classic sort of Blackjack/21 set up – you can keep adding rolls and getting better results to fix the problems, but if you roll badly, you lose all the points. Which then sets up the core of the game: You can lose all the points, and lose Admiration of the people and gain Contempt (which eventually gets you ousted) or you can lie, and cover up the failure, keeping the points, and keeping your good name. Of course, there’s always a chance that the Lies will be revealed before you can fix the problems, then, the more lies you’ve told, the more things come crashing down. I think this game does an amazing job of nailing so much of what goes on around politics. The fact that the problems took years or decades to create, and you’re expected to clean it up in a short amount of time. The ways in which people find themselves rationalizing to keep power, in the hopes of making things better overall. The PDF is $6, I recommend it! Time to break that down with some examples. D&D is somewhat a complicated beast – it has very different rules for combat vs. magic, vs anything else, and even from it’s inception had a vast split in “play styles” (aka, being completely different games, procedurally, depending on who was running it). I’ll just talk about combat, so this doesn’t spin out of control. D&D typically finds itself split across two lines here. “Referee” D&D styles has the players declare actions and the GM makes up rulings on the spot that determines success/failure/bonuses/penalties. This type is very particular about methods. By the book D&D styles generally are looser – for example Basic D&D a melee round is 1 minute of you trying to bash someone’s head in using a given weapon, but there’s not a lot of choice or particulars about it. Later D&D gets more particular – 3E introduces grid combat and feats, 4E basically turns every option into the equivalent of a feat. Usually the specificity of the methods plays into the specificity of Events, but in all cases D&D has never gotten very strong into providing events as part of the mechanics. In just about all D&D editions there’s been advice to describe these things in more detail, forcing the group to step up to put this stuff in. Whether that’s a minute long brawl or a 6 second duck-weave-strike, doesn’t particularly matter as far as the sort of low priority given this. D&D has set the basic design for iterative Outcomes – you have a combat round, if both sides are still alive, they decide if they’re running or fighting more, and you keep repeating until someone’s dead, or they’ve decided they’ve had enough. Basically, you gamble taking on more Waste until you reach an Outcome. Aside from being incapacitated/killed, or whatever resources are spent in the process, D&D also doesn’t say much about Outcomes, in fiction. Much like Events, groups are forced to fill in the details about what losing 7 hitpoints looks like in the game. In most cases, it simply is glossed over and ignored. You can see the strong results of what the difference is between referee called D&D and it’s absence – when you have the GM using Fictional Positioning & making up rulings on the spot you don’t need a lot of mechanics because the expectation is that the GM will do all that. When you don’t have that, the group is looking to the mechanics, which for most editions provides very little support into specifics, only into general strategy and results. You can see a lot of gaps where translating fiction into mechanics and mechanics to fiction are left open and many groups generally end up defaulting to “I attack.” “I retreat” etc. PTA doesn’t do a lot of demands for Methods – usually you only need to know enough to know a conflict is beginning and which Traits apply. That said, there’s a simple pressure towards doing more detailed methods – Fan Mail. Bland descriptions don’t get you Fanmail, good descriptions will. The results of the conflict also don’t demand detailed events, but Fanmail nudges the narrating player towards doing so. In play, what happens is that groups focus on the things that are interesting depending on the people at the table, and drop the rest. PTA is strictly negotiated group stakes. Beyond that, everything else falls into the narrating player’s hands. The Narrating player sets these up and though the game doesn’t say anything about it, once you get a little proficiency in play, it becomes one of the best ways to set up future conflicts. PTA does a lot of slick things that don’t become obvious until you play. The game simply marries a system of generating interesting conflicts, a strong sense of genre expectations among the group, and a flexible reward for creating good stories. Because good descriptions of Method, Events, and Waste are naturally part of conflicts in stories, Fanmail pushes everyone towards producing those things without a lot of fuss about translating things back and forth from mechanics to fiction. HQ generally does ask for a good number of methods because the GM sets pretty heavy modifiers based on whether the action described is appropriate or stretching. HQ plays loose with this, both in short and extended contests. The lack of support here actually makes this one of the places where groups have to step up to fill in the details. In extended contests this becomes somewhat of a chore at times, because both Outcomes and Waste remain unknown until the end of the contest – describing someone attacking someone with a sword and being unsure of how bad the results are means you end up with a lot of vague descriptions. In practice HQ tends to jump between either negotiated stakes by the group or non-negotiated GM fiat, depending on the group and their normal play practices. The only specific outcomes are the result of the Waste rules which comes out the final results of it’s conflicts. Although various editions of HQ have had rules for wounding, they’ve been pretty small stakes. What has been a heavy effect of Outcome or Waste has been the option to risk your allies or followers in a conflict. “Sacrificial friends” is a common heroic genre trope, but it’s kinda brutal as a game mechanic, and one that perfectly fits with HQ’s idea of heroes building networks of alliances and allies… and the costs of using them to your advantage. AW is all about methods. Played to the book, the players actually should only be describing methods at all times, and it’s the GM’s job to really look at the Moves. AW throws out modifiers determined by method and simply sticks hard to “What method?” = “Use this Move”. AW is also about events. Because any given Move can be deeper zoomed in to a single moment, the results of Moves becomes Events, as well. It does a slick thing where Moves often provide lists of possible results, which produces Events and Outcomes in one go. AW takes a relatively traditional view of Outcomes – effectively everything is an iterative action, and the Outcomes are when the fiction changes enough out of the Moves. This is actually why a lot of folks read and play AW then walk away saying, “Wow, I can use this GMing advice for other games!” – the Principles and Hard Moves fill in a structural support for what has been left GM Fiat for most games. First, to repeat: the easiest mechanic is “You say it and it happens” and every other mechanic has to provide something worthwhile to be better than that. Ok, in the imaginary events in your rpg, four things will come out of any conflict: Methods, Events, Outcomes, Waste. This has historically been a big thing in rpg design because characters have different stats for different abilities, skill levels, and tons of modifiers that can happen depending on HOW you’re trying to do something. Games that especially work close with methods often have lots of different specific skills, or lots of range for modifiers based on how things are being done. Burning Wheel uses lots of different skills, while Hero Quest applies big modifiers on the basis of methods. This tends to be a big thing for a lot of games when it comes to combat – they’ll track each hit or miss, but when it comes to a skill roll, there’s no close-up on events. Games that have mechanics that produce a lot of events tend to often take longer to resolve – they’re usually iterative and maybe very specific in methods – “What kind of attack, what angle, what order, etc.” Event-producing mechanics can help groups really get a feel for the imaginary situations in play, and feel out what kinds of things fit for the game’s genre expectations. Games tend to be across the board with this. Historically, we see this mostly nailed down when it comes to combat and life and death, and left to GM fiat in nearly everything else. Specific outcomes gives significant weight to conflicts, and makes it clear what is on the line. Negotiated outcomes are flexible, but require good group communication and guidelines. Non-specific, non-negotiated outcomes basically forces the group to decide effective and appropriate results, sometimes with better or worse play results. You might think this should be a subset of outcomes, but I think it deserves it’s own space, as many games split success/failure and little/great cost in the process. For example dungeon crawling D&D is often pointed to as a game about long term strategy- conserving resources (cost) over several battles. Much like outcomes, this might be hardcoded into the game system, negotiated up front, or un-negotiated and decided by the GM, or some other method. Why should we think about these at all? First, it’s really useful because when you look at how games handle conflict mechanics across these four axises, you start to see where a game starts asking players to make choices, to put in work and to be creative. Second, you can see where a game forces players to do work, and how. One game might require lots of dice and math and steps, but produces every sword swing and dodge along the way. Another game might have very little but the group has to be creatively up to describing all of those things in an interesting way. Third, you also can start looking at what makes for the kinds of stories you want to see. Games that hardcode in certain things produce certain kinds of stories. For example, if you find yourself fudging dice results to avoid death in combat, the mechanics you are using are not producing the kinds of stories and gameplay you want to create – what does it do and what could you use differently? Maybe simply changing the outcome (“and now you’re knocked out”) is good enough? If you’re designing a game, something this division really helps is this: what does protagonism look like for the characters, and how does your game support it? How can certain rules or lack of rules take it away? How does any of these contribute to the stories & gameplay you want to happen? How does any of these get in the way of the stories & gameplay? 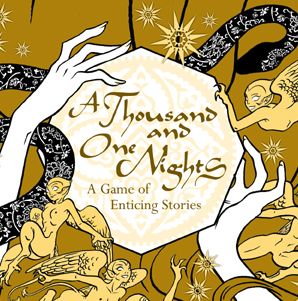 I’ve been totally out of it and didn’t even know 1001 Nights had a new edition coming out with an Indie Gogo campaign – you’ve got like 7 more hours to get in on this. First off, this is a great RPG all around. It’s GM-less and the rules are very simple. Everyone is a servant in the Sultan’s Court, with your own ambitions, goals and jealousies. Every scene the players take turns telling stories, where you recast the characters as folk tale characters to basically talk trash or try to say what you feel without openly saying what you feel. The other players affect the stories by asking questions which shapes the stories, and sets up a dice economy. At the end of the story, everyone has some amount of dice, which you use to try to either fulfill your ambitions, block other people’s ambitions, escape the Court altogether, and very importantly, avoid the Sultan’s wrath which results in your execution. It’s really easy to learn, non-roleplayers pick it up quick and I’ve always had a great time with it. You are currently browsing the Deeper in the Game blog archives for August, 2012.